Properties in Packwood average 4.6 out of 5 stars. Property 1: Maison de Montagne; get away from it all and have it all at the same time! ‘Alpine Annie’s’ - 30 Min. to White Pass Ski Area! Property 4: ‘Alpine Annie’s’ - 30 Min. to White Pass Ski Area! Property 5: Most Popular Mt View Cabin, Htub, Fp, Elk Roam, Amazing Views, Walk to Town! Property 8: A Peaceful Private Setting with lovely landscaped garden including fish pond. Great Cabin in Packwood w/ WiFi , HBO and RoKu. Property 11: Great Cabin in Packwood w/ WiFi , HBO and RoKu. ‘Cedar Cabin’ Cozy 1BR Packwood Cabin w/Mtn Views! Property 12: ‘Cedar Cabin’ Cozy 1BR Packwood Cabin w/Mtn Views! Property 14: Enjoy winter activities in the mountains and a cozy warm fire awaiting you. Near White Pass for skiing, wood stove, and jacuzzi! Property 19: Near White Pass for skiing, wood stove, and jacuzzi! A Well Kept Secret. Great for Skiers, Hikers, or Romantic Getaway. Property 21: A Well Kept Secret. Great for Skiers, Hikers, or Romantic Getaway. Property 22: Book Now for Winter Getaways at Mountain Retreat! So Close to Winter Recreation! Property 26: ‘Log Cabin’ Cozy 1BR Packwood Cabin w/ Mtn Views! 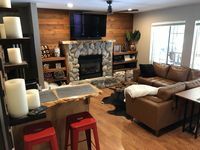 The Elk Run Lodge-close to town, hot tub, game table, Apple TV and fire pit. Property 29: The Elk Run Lodge-close to town, hot tub, game table, Apple TV and fire pit. 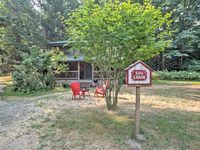 Property 30: Cozy Cabin in Packwood w/ WiFi , HBO and RoKu. Property 31: 'Grizzly Tower' Packwood Cabin w/ Forest Views! Family Vacation Getaway- Visit Mt Rainier & more! Property 33: Family Vacation Getaway- Visit Mt Rainier & more! Property 36: Don't Settle for LESS than the BEST! Property 37: This Rock-N-Roll Cabin Is Quaint and Super Fun. Property 45: Welcome to Bearadise Shack, where you can get away from it all! Property 47: NEW LISTING! Stunning Creek-Front Cabin, Just Minutes From Mt. Rainier! Property 48: Mt Rainier Couples Cabin - Open Year Round! Secluded Mt. Rainier Cabin - Wifi - Wood Stove - Snowshoes - Great for couples! Property 49: Secluded Mt. Rainier Cabin - Wifi - Wood Stove - Snowshoes - Great for couples! This place is in such a great woodsy area. The best way to describe this place is a glamorous rustic cabin. While we stayed there my grandkids didn't get bored. Games, shared with laughter was the true gift from my grands. This cabin has everything and more!